At the outset, the money from Fonda's workout videos went to the Campaign for Economic Democracy, an organization she co-founded with her second husband, Tom Hayden. Above, she exercises in her Beverly Hills studio in September 1979. 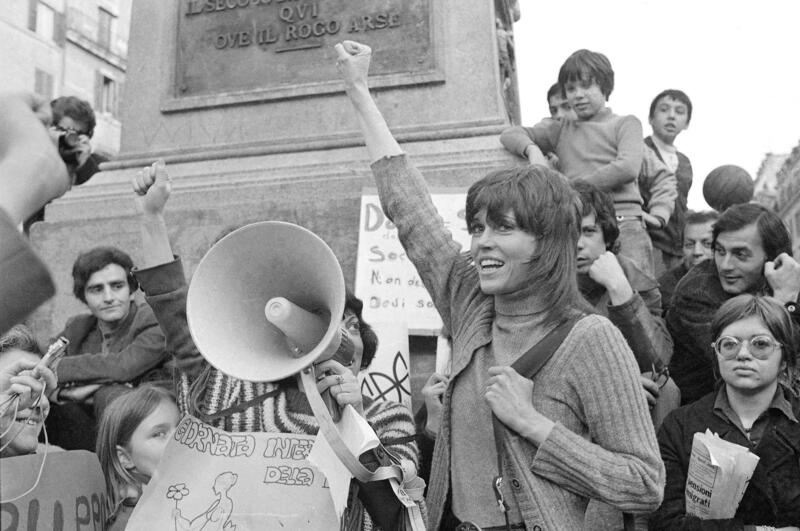 Fonda participates in a demonstration in Rome on March 8, 1972. 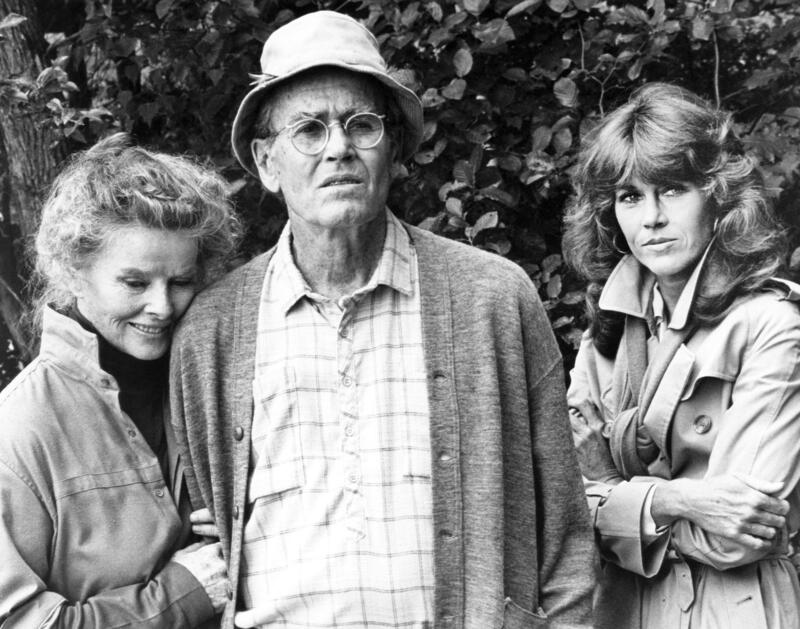 Jane Fonda, right, starred alongside her father, Henry Fonda, and Katharine Hepburn in the 1981 film On Golden Pond. Filmmaker Susan Lacy tells Fonda's story in a new HBO documentary called Jane Fonda in Five Acts. The first four acts are organized around the men in Fonda's life — her father, Henry Fonda, and her three husbands, Roger Vadim, Tom Hayden and Ted Turner. The last act is Fonda's own. Fonda acknowledges she's redefined herself again and again, but says her courage has been a constant. "I've always been brave," she says. "There's been a certain integrity and that was always there in spite of my willingness and talent at becoming who my husbands wanted me to be." Lacy describes the documentary as a portrait. Fonda — who only saw the film after it was complete — says it's a "gender journey." At every stage of her life, Fonda says she's asked herself: Am I all that I can be? "One of the things I hope that people will take away from my documentary is the value of an examined life," she says. "You don't become wise by having a lot of experience; you become wise by reflecting deeply on the experiences that you've had." "I'm almost 81 and I feel better than I ever have," she adds. "I know that sounds preposterous, but it's true." Up until my 60s, I never thought that relationships should be democratic. I had never seen a democratic relationship between a man and a woman. Certainly my father who was married five times — none of his relationships were democratic. So I just thought it was the way things are supposed to be. I tried to do whatever I could do to be sure that the men I was with — all of whom were utterly brilliant and fascinating — loved me. I was a pleaser and it took me into my 60s and 70s to begin to say: I deserve respect. I am somebody on my own standing, on my own two feet, and I'm going to begin to define my own life. [It] took a long time, but we live so much longer ... than our parents and grandparents on average. So it's not bad being a late bloomer. You have to own your mistakes and you have to learn from them. And while my three marriages didn't last, I don't regret any of them. I learned a tremendous amount from all three remarkable men that I was married to. And I think I had to go through that to end up where I am. He hated emotion — emotion terrified him, which is pretty interesting in an actor. He always wanted to do things exactly the way they had been rehearsed. And so when we were playing that scene I waited until what I thought was going to be his last close-up and then I did something that we had not rehearsed. ... I reached out and I touched his arm and he ducks his head and he reaches his hand up to cover his eyes. ... I could see his eyes well up and it meant the world to me. All the audience sees is him kind of turning away and ducking his head and covering his eyes. It was a big deal for me. ... I cry every time I see it ... it was so hard for me to do. One of the great things about getting older — if you've bothered to really examine your life and really figure out who your parents were, and who your grandparents were — you come to the realization, as I did with my father, that it's not that he didn't love me — he just didn't know how to express it. ... But he did the best he could. I've studied parenting ... and I came to understand what good parenting looks like. I didn't know that when I became a parent so I just I didn't know what to do. But I know now that it's never too late. I think my daughter and I are growing closer. I flew her from where she lives in Vermont to be with me in California and I showed her the documentary ... she's not in it — she chose not to be in it — and I didn't want her to see it publicly. I wanted her to be with me and — phew! — she liked it. She thought it was really, really well done. She cried a lot. So that was a huge blessing for me. We have writers working on a script for a sequel with a very funny premise and I'm hoping it will happen. ... The issues in offices for women today are even worse than they were back in the day when we made the original. ... Sexual harassment is not abating in offices so that's still very much a topic. But today many people in all kinds of jobs — not just office workers — they're not beholden to the boss. They're hired by another company and then subcontracted to the company where they work. So if they're fired because of pregnancy, or there's wage theft, or sexual harassment, who do they go to? ... I mean it's just a catastrophe for more and more working people. And we want to try to hit all that and still have it be really funny. Final acts are really important — just like they are in the theater. ... I have since 2002 spent a lot of time ... determining what I want to do with my final act. ... I didn't want to get to the end of my life with a lot of regrets when it was too late to do anything about it. ... It's important to face death, and accept it, and understand it, because then you can kind of prepare. I visualize my death and I want to have people I love around me — which means between now and then I have to deserve to have people around me who love me. Marc Rivers and Emily Kopp produced and edited this interview for broadcast. Beth Novey adapted it for the Web. Jane Fonda has lived many lives from starlet to fitness guru to Vietnam protester and now a comedic actress, securing roles at an age when most people in Hollywood have left the screen. A new documentary on HBO is called "Jane Fonda In Five Acts." Our co-host Ari Shapiro talked with her about it. When I asked Jane Fonda about the transformations she's gone through in her 80 years, she recalled a conversation she had with her daughter two decades ago. JANE FONDA: I said, would you help me, you know, make a video of my life, a real short one? And she said, why don't you just get a chameleon to crawl across the screen? Ouch. She knew what buttons to push. And she wasn't wrong. SHAPIRO: Part of Jane Fonda's fame comes from the fact that she's pushed a lot of people's buttons over the years, including President Richard Nixon. That was after she visited North Vietnam, posed in a photo with a Vietnamese anti-aircraft gun and got the nickname Hanoi Jane. The film begins with an excerpt from the Nixon tapes. And Jane Fonda told me she has heard this so many times over the decades she practically has it memorized. RICHARD NIXON: So sorry for Henry Fonda, who's a nice man. J. FONDA: She's a good actress. NIXON: She's a great actress. J. FONDA: She looks good. NIXON: She looks pretty but, boy, she's often on the wrong track. J. FONDA: But she sure has taken a wrong path. SHAPIRO: What does that represent to you? J. FONDA: I'm here, and he's not (laughter). J. FONDA: I mean, I feel bad that he felt that way, but I can laugh about it now. And I think it's a great way to begin this documentary. SHAPIRO: You have told your own story before in a memoir. You allowed someone else to tell this story for you. You did not direct or executive produce this film. J. FONDA: Right. I never saw it until it was all done. And I think it was really smart that she divided it the way she did, into these five acts. SHAPIRO: She of course being Susan Lacy, the director. J. FONDA: Susan Lacy, who created American Masters at PBS and has now moved to HBO. The four acts being the men in my life, my father and then my three husbands, and then the fifth act is Jane. And it's kind of - becomes a gender journey more clearly that way. SHAPIRO: The first major male influence on your life was your father, the great actor Henry Fonda. And you describe him as emotionally open and authentic on screen but distant in real life. And you finally found a way to bridge that gap on film with the movie "On Golden Pond" in 1981. J. FONDA: (As Chelsea Thayer Wayne) Hello, Norman. HENRY FONDA: (Norman Thayer Jr.) Oh. J. FONDA: (As Chelsea Thayer Wayne) Happy birthday. H. FONDA: (Norman Thayer Jr.) Look at you. Look at this little fat girl, Ethel. SHAPIRO: And there's this one scene where you and your father playing father and daughter have this heartfelt conversation. And in the film, you reveal something that you had planned for this scene without telling him. J. FONDA: Well, he hated emotion. Emotion terrified him, which is pretty interesting in an actor. And I did something that we had not rehearsed that I hoped would bring some emotion up. And I reached out, and I touched his arm. J. FONDA: (As Chelsea Thayer Wayne) I want to be your friend. H. FONDA: (As Norman Thayer Jr.) Oh. This mean you'll come around more often? Mean a lot to your mother. J. FONDA: (As Chelsea Thayer Wayne) I'll come around more often. And he ducks his head, and he reaches his hand up to cover his eyes. But before that, I could see his eyes well up. I cry every time I see it. I cry so hard. It was so hard for me to do. SHAPIRO: And when the cameras stopped rolling, were you ever able to have a conversation about what that had opened up? J. FONDA: Well, I tried. I asked if I could come over for dinner where he and his wife, Shirlee, were staying on location. And they had me over. And I described what doing the scene had meant to me. And I asked him if - you know, if he could relate to any of that. He said no. J. FONDA: But you know something? One of the great things about getting older - if you've bothered to really examine your life and really figure out who your parents were, you come to the realization as I did with my father that it's not that he didn't love me. He just didn't know how to express it. But he did the best he could. And I was able to forgive him. And I love him so much. And I miss him a lot. SHAPIRO: How did that become part of your identity? Where did you learn the routines that you became so famous for? J. FONDA: I learned the routine - the original routine from a woman named Lenny Kasdan (ph). And I turned it into a business because at the time Tom Hayden, my second husband, and I had started a statewide organization in California called the California Campaign for Economic Democracy. And I said, I got to start a business that can fund the organization. And it was the workout. All the money went to the Campaign for Economic Democracy. SHAPIRO: I had no idea. I assumed that you got rich off of these videotapes, and actually it all went to fund this nonprofit. J. FONDA: Yeah. Eventually I bought it back after three or four years because I wanted to grow the business, and I couldn't because all the dividends were going out to the organization. But it was an important organization, and the money really made a difference. It was terrific. I'm very proud of that. SHAPIRO: You have so many projects going on right now from "Grace And Frankie," the wonderful Netflix comedy, to rumors - or are they more than rumors? - of "9 To 5," the seminal movie, coming back with many members of the original cast. J. FONDA: Well, we have writers working on a script for a sequel with a very funny premise. And I'm hoping it will happen because guess what? It needs to happen. The issues and offices for women today are even worse than they were back in the day when we made the original. SHAPIRO: Even worse - that's interesting to hear you say. J. FONDA: Yeah. There are several reasons. Sexual harassment is not abating in offices. But today many people in all kinds of jobs, not just office workers - they're not beholden to the boss. They're hired by another company and then subcontracted to the company where they work so if they're fired because of pregnancy or there's wage theft or sexual harassment, who do they go to? I mean, it's just a catastrophe. And we want to try to hit all that and still have it be really funny. SHAPIRO: You are constantly working and on screen today. You seem to be in great health. And as we talk about this "Jane Fonda In Five Acts" documentary, I wonder what you've learned about this final act and what you want to get out of it. J. FONDA: Well, one thing I've learned is in order to know where you're going, you have to know where you've been. One thing I knew is I did not want to die the way my father did. He died with regrets. I live, I am happy to say, a very examined life. And one of the things I hope that people will take away from my documentary is the value of an examined life. You know, you don't become wise by having a lot of experience. You become wise by reflecting deeply on the experiences that you've had. And that's what I've tried to do. And it's made all the difference to me in my life now at 80 years - I'm almost 81, and I feel better than I ever have. I know that sounds preposterous, but it's true. SHAPIRO: Jane Fonda, it's been a pleasure talking with you. Thanks so much. J. FONDA: I appreciate it very much. Love the show. SHAPIRO: The new HBO film by director Susan Lacy is "Jane Fonda In Five Acts." Transcript provided by NPR, Copyright NPR.